Those considering a career as an LPN may want to consider working in the state of Arizona. With the proper education and credentials, practical nurses shouldn’t have trouble finding a job in this state. According to the state’s Board of Nursing, there are currently 10,545 active LPNs in Arizona. However, the U.S. Department of Health and Human Services projects that Arizona is expected to be short more than 9,500 LPNs by 2025. Those who want to be on the leading edge of fighting that shortage can enter the nursing workforce after completing an accredited, state-approved LPN program. These programs, which typically require two years or less of study, prepare students to work in a variety of settings, including offices of physicians, nursing homes, outpatient clinics, and hospitals. Those who are ready to start working towards this rewarding career should read on to explore LPN programs in Arizona, get a better idea of state licensing requirements, and review LPN salary and employment figures. 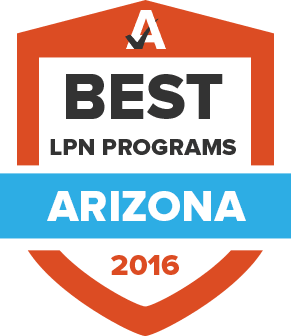 LPN programs in Arizona are a popular academic option, and can be found at community colleges, vocational schools, and even some public and private institutions. Aspiring practical nurses can use the following customizable search tool to filter through LPN programs based on their academic preferences and needs, and then compare a short list of potential schools to find the best fit. The first step towards licensure for any aspiring LPN is graduating from an approved practical nursing program. This usually requires between one and two years of study, depending upon the school. Those who graduate in Arizona can file a Certificate of Completion with the nursing board, while those who graduated from an out-of-state school will need to have official transcripts sent from the school to the Board of Nursing. LPNs who have a license in another state can apply for Arizona licensure by endorsement. In addition to program verification, applicants seeking endorsement will need to submit evidence of a passing score on the NCLEX-PN, provide proof of previous or current licensure in another state, and must complete a nursing program that meets the state’s educational standards and has been assigned a nursing program code by the National Council of State Boards of Nursing (certain exceptions may be granted by the Board). The fee for licensure by endorsement is $150. Renewals are expected every four years, on or before July 1. The State Board of Nursing encourages nurses to submit their renewal requests online. There is a $160 renewal fee, and a $50 late fee per month for tardy renewal applications. Arizona LPNs can enjoy the job security that comes from a vast nursing shortage; they might also see wages that are above the national average. Here is what nurses can expect when they work in the Grand Canyon State. Similar to salary, employment opportunities and growth can vary across the state. Certain regions of Arizona may experience exceptional outlook for LPNs, while others may see slower job expansion. The data in this section provides a closer look at LPN employment trends in the state. This large organization for nurses focuses on a wide variety of subjects of interest, including continuing education, ethics, health and safety, public policy and more. This association caters to nurses through a variety of events, advocacy matters, continuing education and the like. This comprehensive and easy-to-navigate site offers all nurses need to know about beginning their career in Arizona. This membership site offers numerous points of interest for LPNs, including information on certifications and training. This professional association supports nurses with legislation and lobbying, continuing education, and annual convention and much more.